Note: Highroller.com doesn’t accept players from the US. Be sure to check out awesome casinos like Casino Max and Cherry Jackpot instead. Featured in the 10 Best New Mobile Casinos list. T&C: The wagering requirement for the 1st-deposit match bonus is 35x the bonus amount. Min deposit €/$10. Game weighting and time restrictions apply. New 18+ customers only. Gamble responsibly. Full T&C. The Highroller Casino is finally here. And it could easily be one of the most gamified online casinos ever. We’re talking about wager free bonuses, level-ups and loyalty treats, in a realm of its own. And in the epicentre is a place for you and your ballin’ Metrocity character that you can customise (see images). See it for yourself: Go to Highroller Casino right now. So why should you care (or not) about Highroller.com? First, it’s part of the same award-winning group as Rizk, Guts, Betspin, Thrills and Kaboo. So to begin with, the bar is lifted very high. Second, think regular gameplay rewards with no strings attached and lots of free spins, as well as top-notch games from NetEnt, Evolution, Quickspin and more. And all that in a sleek environment, and proper UK and EU licenses, so players from the UK, Canada, Germany, Scandinavia and other parts of the globe will feel like home. There certainly are if you look hard, like the fact that there are no game races or tourneys. And if you prefer the good old retro Vegas theme with a full-service VIP club, then you won’t find that here either. Fast lobby with top games, jackpots and a live casino. Without further ado, here’s a sneak peek at Highroller Casino and its “revolutionary” features, including the latest updates and hot tips! As expected, some Highroller promotions are wager free. And this includes the no-deposit signup bonus. How to get one? See the step-by-step Highroller registration video below for how hard or easy it is. It’s that simple and you can win more than me if you’re lucky. 💥 Signup bonus: Get 20 Coins + a free Sting Game on registration. What are Coins? — Coins are Highroller’s secondary currency (like Kaboo’s Relics or Ikibu’s Seeds), which you can exchange for wager free rewards in the Shop. So whatever you win, you can cash in! What is a Sting? — It’s a game which earns you more Coins! More specifically, you get to steal them from other players and they can steal them from you (if you’re not active for a while). Learn more: Coins and a Sting Game explained. Note that you’ll still need to have at least 50 Coins to buy any goodies from the Shop, so you need to make a deposit and play a few slot rounds to earn those extra coins. The good news is that the real bonus is yet to follow. Get a match bonus with 50 Free (Extra) Spins on your 1st deposit. Here’s how the fresh Highroller Casino welcome bonus looks like. 🔥 Welcome bonus: Top up €/$100, play with €/$200. This is a 100% match bonus, so if you deposit a minimum of €/$10, then you’ll get to play with €/$20 in total. Note that from July 2018 players in your region won’t get the additional 50 Free Spins. However, the wagering requirement got better and was decreased from 45x to 35x the bonus amount. Min qualifying deposit: $/€10 or £20. Max single bet limit: £/$/€5. Learn more: Visit Highroller Terms & Conditions page. New 18+ players only. Gamble responsibly. Here’s some thoughts: Although some high-RTP slots are excluded from the wagering, table and card games count considerably more than usually (especially good news for roulette players). Overall, it’s a decent package for both low and medium rollers! 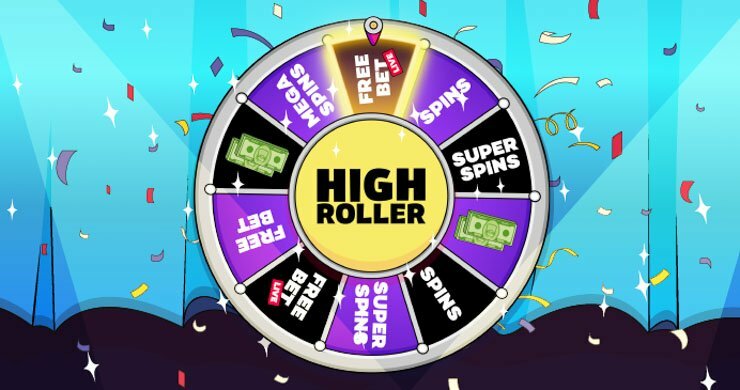 Highroller Casino Rewards – Play, Spin and Get Stuff! Introducing the new Highroller Wheel with guaranteed prizes. As a High Roller player, you’ll be playing as a character (fully customisable). And, since March 2019 they’ve added a similar badass wheel of fortune like Rizk Casino. They call it simply: Highroller Wheel! Play! — Play your favourite games with real or bonus money. Level up! — Reach the end of your progress bar (under your avatar) to get to the next District. Spin! — Spin the new Highroller Wheel and win guaranteed prizes like spins (all wager free, of course). This includes not only Free Spins, but also Super and Mega Spins that are worth 10x – 30x the normal amount, free bets on Live Casino games, and some good old cash. 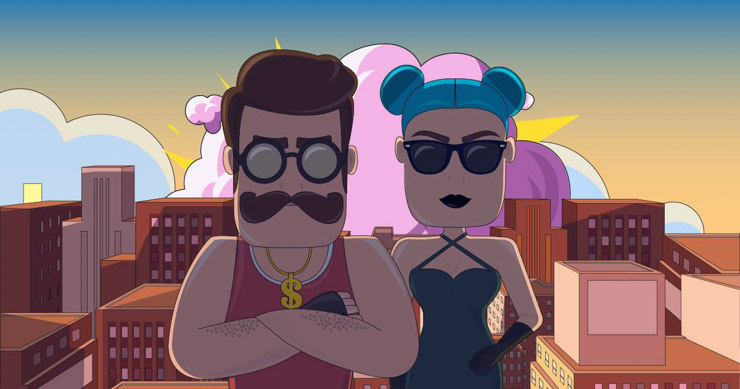 👍 Tip: Whenever you play, you also automatically earn Coins, which you can then exchange for more bonuses like the above in the Highroller Shop. 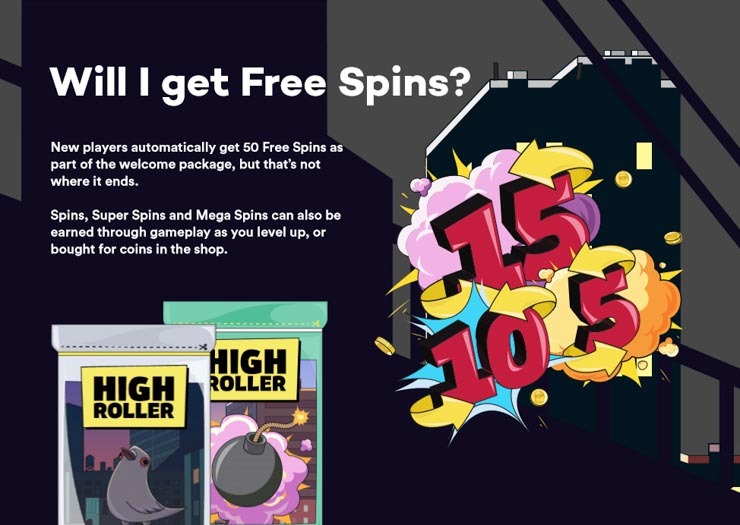 For some added variety, the team at Highroller.com will also throw in regular promotions. So stay alert and keep your eyes open for updates. Okay, here’s what you need to know about the banking. Featuring both popular and localized payment options and fast processing times. We all like free banking, right? Unfortunately, that’s not the case with this blockbusting casino. Now all GiG casinos, including Highroller, don’t charge you extra when you make a deposit or withdrawal (just like the new Rolla). This means there are no more banking fees! Then they made sure to include both popular and localised payment providers. 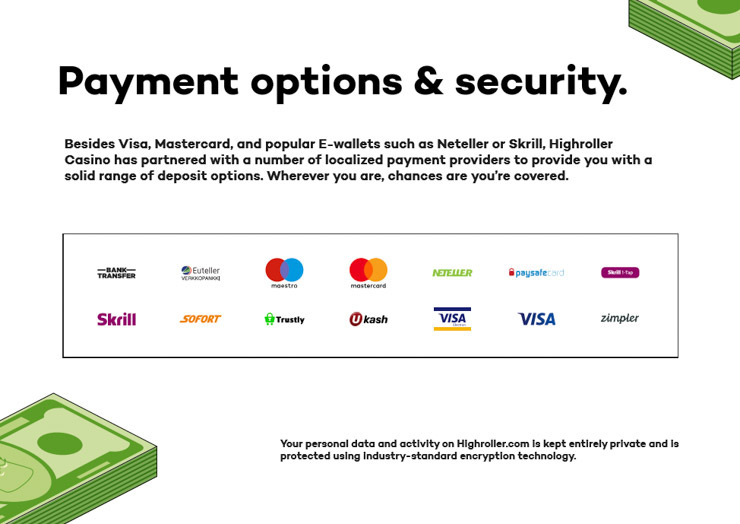 There’s a total of more than 10 banking methods, including Visa, MasterCard and Maestro, Skrill, Neteller, as well as paysafecard, Zimpler, SOFORT/Klarna, Trustly, Ukash, and Euteller. To go with that, they also have many currencies: EUR, GBP, USD, SEK, NOK, CAD, NZD, etc. With that, you can avoid unnecessary exchange fees. Withdrawal times are fast, within 24 hours during busy periods. And this will get even better for verified customers who have done the usual KYC checks. Featuring over 500 mobile-friendly casino games, including jackpots and live dealers. The trend goes: the more casino games and suppliers, the better. Right now, you’ll find well over 500 online slots and table games across all GiG casinos, and this Baller site is not an exception. As usual, there’s no download required to play any of them. While we won’t see the High Roller Casino mobile app anytime soon, the site is mobile-first, so you won’t really need one for a snappy mobile play. Here’s what games they’ve got for us. There are over 750 casino games in total. And these are powered by some of the most popular iGaming studios like NetEnt, Play’n GO and Yggdrasil, as well as Red Tiger Gaming, Thunderkick, Quickspin, and Microgaming. Many more will surely join the list later on. 👍 Exclusive games! 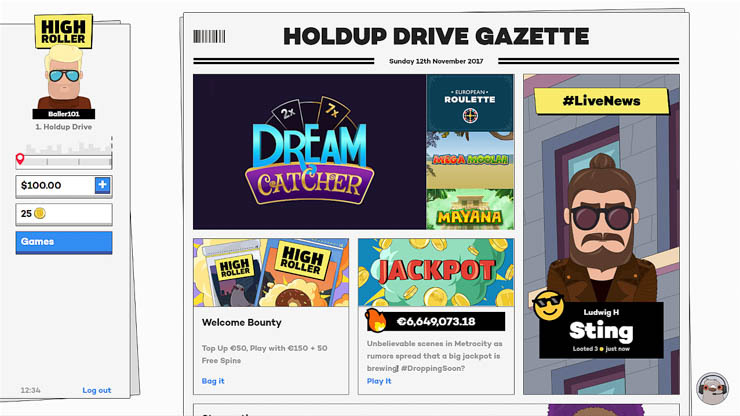 — Yes, Highroller also has them, powered by GiG Games! This is how the Highroller lobby looks like at a glance. Speaking of live dealers, we may sooner or later see exclusive table games too, like Rizk or Kaboo Roulette, powered by NetEnt. As far as sports betting goes, then Highroller.com won’t be hosting them for the time being for sure, so your best bet is its award-winning sister site Guts. 24/7 support via chat, phone or email (in at least 5 languages). Like all GiG casinos, Highroller Casino also offers 24/7 customer service, via email or live chat. Their international team of Rollers speak at least 5 languages: English, German, Swedish, Norwegian and Finnish (don’t worry, you won’t be speaking to that pidge!). High Roller Casino is live from November 2017. Highroller.com is live and accepting new players. While it’s definitely not for everyone, it’s not easy to find any deficiencies with it either. It’s just one well-made online casino that seems to target players who judge an operator by the whole package, beyond just the games and welcome bonuses. Signup bonus — get Coins and a free Sting Game on registration (to win wager free rewards). See the how-to video for more details above. Welcome bonus — new players will get a deposit bonus + 50 Free (Extra) Spins (see T&C). Never-seen-before casino journey – cool design, unique theme and customisable characters that were cool even before Apple announced Memoji! Coins and rewards – play, automatically earn Coins for more bonuses and spin the Highroller Wheel to win guaranteed prizes on every level-up. Over 750 games — latest releases, exclusive games, mega jackpots and live casino. Powered by 20+ iGaming studios (no download and 100% mobile compatible). Banking — enjoy fast, 24-hour payouts in local currency and 14 payment options in total (no more processing fees). 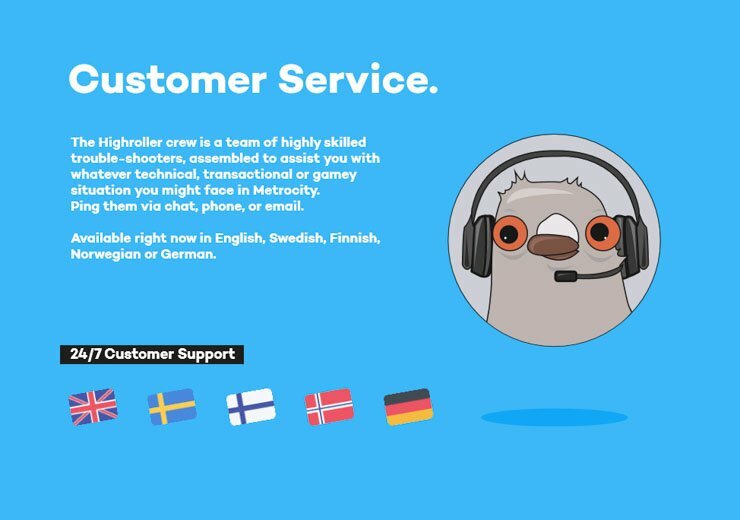 Customer support — play with peace of mind and a 24/7 customer service (in 5 languages). 😎 Find out more: Sign up at Highroller.com to get your first wager free gift. P.S. Should you have any questions or concerns then get in touch with me. I’ll be happy to help you. P.P.S. If you liked this casino then you’ll most likely enjoy the newly-launched Wishmaker as well. Any opinions about the new casino? What would you like to see or prefer they didn’t include? Leave your comments below. T&C: The wagering requirement for the 1st-deposit match bonus is 35x the bonus amount. Min deposit €/$10. Game weighting and time restrictions apply. New 18+ customers only. Gamble responsibly. More details.